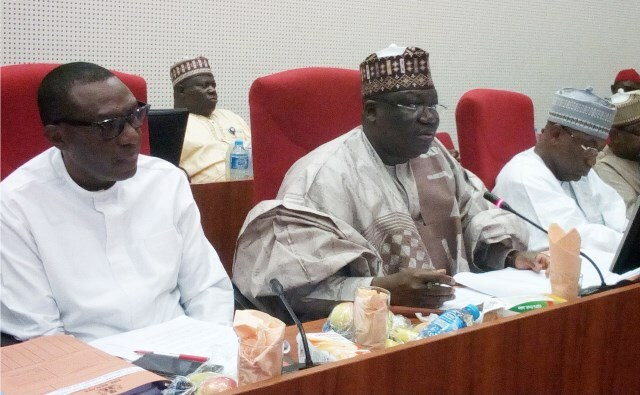 L-R: Chairman of the Senate Committee on Interior, Senator Andy Uba, member, Ahmed Lawan and Chairman, Kabiru Gaya, during a public hearing organised by the committee to investigate the application of 3.5 billion dollars petroleum subsidy fund by the NNPC and subsidy recovery fund in Abuja, recently. The leadership of the National Association of Plant Operators (NAPO), and Nigerian Liquid field Natural Gas (NLNG) and other contracting firms have disagreed over the employment process adopted by the NLNG in the recruitment of workers in Bonny Local Government Area of Rivers State. The President of NAPO, Comrade Harold Benshowe, accused the management of the NLNG of aiding employment rack in Bonny, saying that it was wrong for NLNG to insist that those seeking for employment in its contract firms must pass through Bonny integrated Recruitment Centre (BIRC). Benstowe stated this during a meeting called by the Zonal Director of Federal Ministry of Labour and Productivity racketeering Mr Isiramen Princewill in Port Harcourt recently, to resolve a dispute between members of NAPO, NLNG and other contracting firms with the multi- national. Benshowe said the BIRC was managed by Labour Centractors whose aim and objectives was to short-change potential Nigerian workers seeking employment, adding that such practice was contrary to the labour practices in the country. “What NLNG should do as a matter of facts is to make their employment recruitment opportunities open so that quailed Nigerian youth irrespective of their religion and ethnic background can vie for jobs. They must not be allowed to pass through BIRC before they can work in NLNG. We are ready to moblise our members against the company if the process is not stopped”, he threatened. Benstowe said the union would not stop at nothing until its demand for 100% allocation of the operations are given to its members, adding that members of his union seeking for placement in NLNG contract jobs are professionals and can not be treated as second hand. He called on the Federal government through its relevant agencies to jettison Obnoxious labour practices. Also speaking, the Zonal Director, Federal Ministry of Labour and productivity in Port Harcourt, Mr Isiramen Princewill, warned NLNG against patronising unlincensed labour contractors in its recruitment exercise. Earlier, the representative of NLNG, Mr Don Otobo, told the gathering that members of the plant operators union (NAPO) declined to accept the 60% employment quota offered to them and continued to insist on having 100% of the vacancies. He denied that the company was encouraging employment racketeering in its job placement and recruitment exercise in the area.